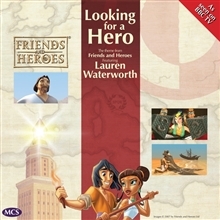 Looking for a Hero featuring Lauren Waterworth : Bible songs inspired by Friends and Heroes Series 1. You can order this moving music CD from our online store. Music CD, What about Love? What about Love? : Bible songs inspired by Friends and Heroes Series 1. A music CD for the whole family! You can order this fantastic music CD from our online store. The story of Elijah and the Prophets of Baal - as you've never seen it before! Portia's Song video - Portia learns that not everything is about wealth: friendship and helping others is far more important! The story of God miraculously releasing Peter from Prison - Acts chapter 12 brought to life! View Lyrics and Song Time Activities that accompany What about Love? here.